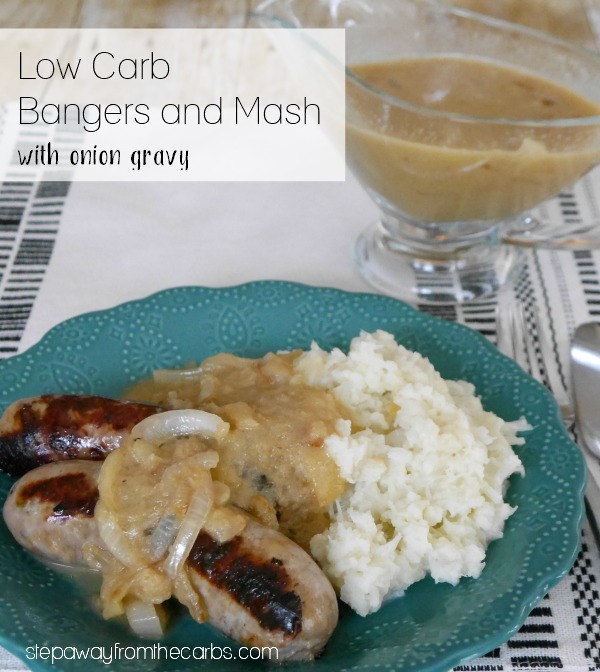 Here’s a low carb version of the British classic – bangers and mash! The following post contains affiliate links, which means that at no extra cost to you, I can make a tiny bit of money to help support this blog. Thank you! Well I certainly feel qualified to write about this classic British meal – as I was (in case you didn’t know) born in England! I moved to the US in 2009, and since then I’ve been learning (fast) about American food and, um, spellings! Bangers and mash, to translate, is just sausages and mashed potatoes. It is often served with peas and/or onion gravy. 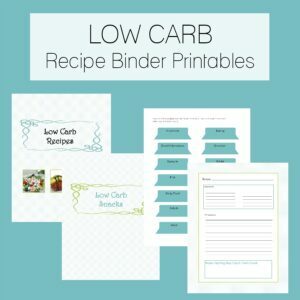 So how to make it low carb? First of all, you need good quality sausages. 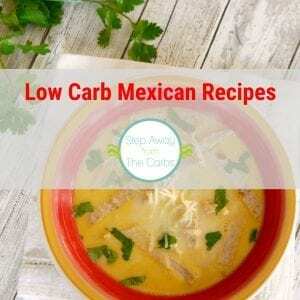 The lower the carb count, the fewer fillers there are in the sausage. Which means you get more meat! The mash is an easy one to swap – serve cauliflower mash instead. My usual recipe includes horseradish, and although this isn’t traditional for bangers and mash, it would be no bad thing! Peas are too high in carbs for me, so I decided to focus on the onion gravy. When I started low-carbing in 2008, onions were considered “phase 2” – and in moderation only. 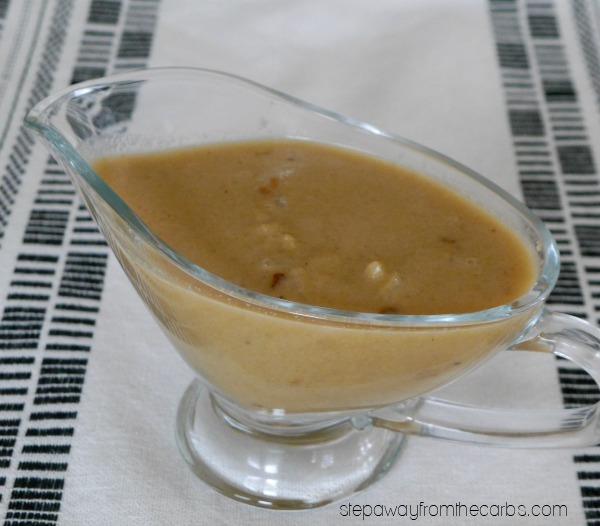 But I think that this gravy is essential to the dish – and really tasty! I don’t think that you need instructions on how to cook the sausages, and here’s the recipe for the cauliflower mash. 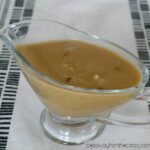 So here’s how to make the onion gravy! Add butter and olive oil to a large skillet. Slice two medium onions and add them to the pan. Sauté over a low-medium heat for 20-25 minutes, stirring occasionally. Set half of the onions aside, then transfer the rest to a blender. Add some beef broth and Dijon mustard, then blend until smooth. Return the blended mixture to the skillet, and bring to the boil. 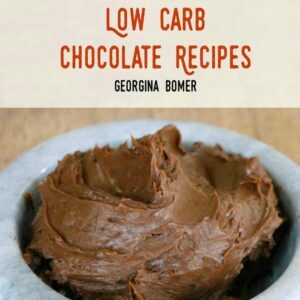 Reduce to a simmer, and add some extra butter for smoothness. Test for seasoning, and add salt and pepper as necessary. Add the reserved onions back into the skillet, stir well, then transfer the gravy to a serving vessel. 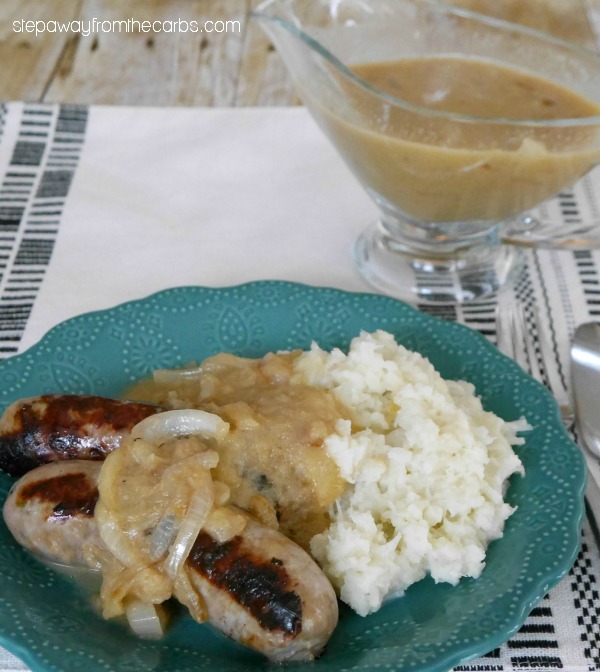 Serve the cooked sausages and mashed cauliflower, then let everyone pour the fantastic low carb onion gravy over the top of everything! Add the butter and olive oil to a large skillet. When the butter has melted, add the onions and sauté over a low-medium heat for 20-25 minutes, stirring occasionally. Set half of the onions aside, then transfer the rest to a blender. Add the beef broth and Dijon mustard, then blend until smooth. Return the blended mixture to the skillet, and bring to the boil. Reduce to a simmer, and add some extra butter for smoothness. Test for seasoning, and add salt and pepper as necessary. Add the reserved onions back into the skillet, stir well, then transfer the gravy to a serving vessel. Just made this and it turned out great, definitely one I’ll be making again. Thank you very much.